The Cadillac Escalade is a full size luxury sport utility vehicle that was introduced in 1999. The Escalade was Cadillac’s first commitment to competing in the sport utility vehicle category. When General Motors was developing the Escalade, they were worried about the 1998 Lincoln Navigator full size SUV from Ford, as well as competition from the Japanese and German premium auto manufacturers. The Cadillac Escalade was designed alongside the 1999 GMC Denali sport utility vehicle, which shares many of the Escalade’s components. The Escalade took only ten months from approval to production, and GM benefitted from being able to get two new vehicles into production on this tight timeline. The Cadillac Escalade wasn’t available for the 2001 model year, but it was brought back for 2002 with some new exterior refinements designed to differentiate the Escalade and the Denali. Cadillac also introduced two new Escalades, the Escalade EXT pickup truck and the extended wheelbase Escalade ESV. The Escalade ESV was built in Silao, Mexico, from 2002 until 2006, alongside the Escalade EXT. For the 2003 model year, the Escalade lineup, including the Escalade ESV, was given an upgraded four-wheel version of the StabiliTrak electronic stability control system. In 2004, Cadillac introduced options such as 20-inch chrome wheels, climate controlled seating and cup holders, and new premium interior options. The Cadillac Escalade family entered its third generation for the 2007 model year, and the Escalade ESV was redesigned along with the Escalade EXT (though the ESV and EXT versions were only in their second generation). Production for these two Escalade models remained in Mexico for this generation, although the standard Escalade’s production was moved to Arlington Assembly. Throughout the years, this generation of the Cadillac Escalade featured a newly designed keyless entry system, updated gauges, Bluetooth wireless integration, an updated navigation system, power tilt steering wheel, standard blind spot assistance, updated tailllights and new exterior color options. Though the Cadillac Escalade is continuing through the 2014 model year, the Escalade EXT was discontinued along with the short-lived Escalade Hybrid ,as well as the Escalade EXT’s sibling, the Chevy Avalanche truck. The Escalade ESV is still in production as of the 2014 model year. The 2014 Cadillac Escalade ESV is more than 18 feet long, and is one of the largest passenger vehicles available, along with its General Motors siblings, the Chevrolet Suburban and the GMC Yukon XL. The Cadillac is, however, more luxurious than the Chevy and GMC variants. The Escalade ESV has enough capacity for eight occupants, as well as plenty of cargo, with a removable third row seat that provides the choice of comfy cabin accommodations or extra storage. 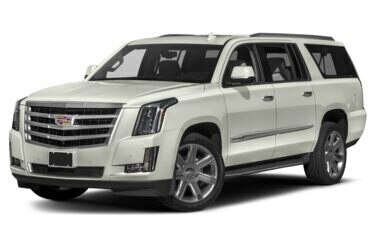 Despite its size, the Cadillac Escalade ESV boasts fast acceleration and plenty of towing capacity, thanks to its 6.2-liter V8 engine, which provides 403 horsepower delivered through a standard six-speed automatic transmission. The V8 is front-mounted and the Escalade ESV comes standard with rear-wheel-drive, but an upgrade to all-wheel-drive is available. The Escalade ESV’s 0-60 time is just over 7 seconds. The Environmental Protection Agency says the Escalade ESV rear-wheel-drive model gets fuel economy of 14 miles per gallon city, 18 miles per gallon highway, and 16 miles per gallon combined. The all-wheel-drive Escalade ESV gets numbers of 13, 18, and 14 miles per gallon, respectively. The 2014 Escalade ESV comes in four trim levels: base, Luxury, Premium and Platinum. The base model comes equipped with 18-inch alloys, automatic adaptive suspension, roof racks, a power lift gate, keyless entry and start, a locking rear differential, xenon headlights, tri-zone climate control, driver memory front seats, heated second row seats, navigation, a rear view camera, Bluetooth wireless integration, and Bose surround-sound audio with iPod and USB connectivity, as well as wireless headphones. Trim level upgrades offer features such as 22-inch alloys or chrome wheels, blind spot assist, rear parking sensors, upgraded suspension, sunroof, heated steering wheel, a rear-seat entertainment system, LED headlights, wood interior accents, climate controlled upholders, and exclusive trim options.